4 H Pictures That Will Get You Blue! 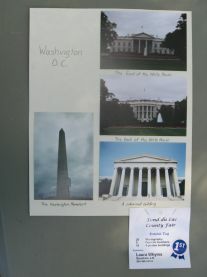 Our homeschool club always had a great selection of 4 H pictures at the fair. That's because we had the best 4 H Club leader...Grandma! She was very influential in assisting our members achieve a number of blue, merit, and state awards. I mean that sincerely, not just because she's my mother-in-law but because she loved working with the children and they loved being with her. Do you have a 4-H project picture that's begging to be on a Web page? You can upload it here! 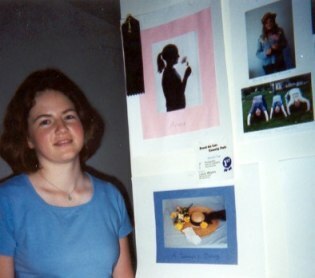 This is Laura (16) standing next to her photos that she took to the fair. The silhouette has the black ribbon because it was selected to go to State. 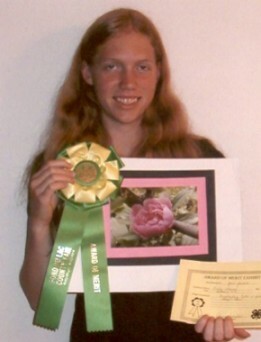 Emily (15) earned an Award of Merit for her rose close-up. Hold the camera steady for still shots or use a tripod. Get in close to your subject without cutting anything off! Do not take a picture into the sun. Pan the camera along for an action shot so that it blurs the background and not your subject. Trick shots are fun. Have someone in the foreground hold their hand out flat while someone in the distance (stands) on that person's hand. That person can also be holding a bottle making it look like they're inside it! Take a lot of pictures, digital cameras make it easy! Read the Member's Manuals: "Adventures With Your Camera" and "Exploring Photography". These are available to any member wanting to take some great 4-H pictures. Side Note - Be sure to give value to your photos when doing your PFR. Looking for more helpful ideas? Terry Holliday has great tips and techniques for creating a pleasing composition. Below are examples of how to mount your 4 H pictures for the fair. 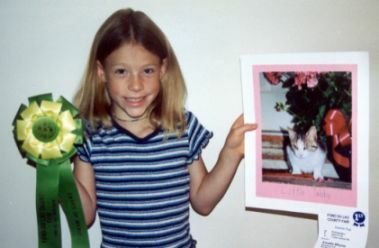 Annette (9) received a Merit for her kitty picture. No matter where you go, there will always be an opportunity for some great 4-H pictures. Don't forget your camera! Got a picture that's just waiting to go public? Here's your chance! Everyone visiting this page is looking for picture ideas. Your photo is just what they're looking for! Click here to see the rest of the form and add your project details.